After a successful first day, I was looking forward to a second day of climbing in Belgian. My legs felt surprisingly good at breakfast and once we were on the road I warmed up quickly in the Spring sunshine as we climbed a hill on the outskirts of La Roche. The road climbed steadily through the villages of Hives and Ortho, with some good opportunities for photography. At one point I was at the front and enjoyed a descent along some wonderful smooth asphalt taking me through some excellent curves to a main road, the N834. Of course, once I reached the road, I realized nobody else was coming along so I had obviously missed a turn. Climbing back up the way I came, I met Robert who coming down to look for me and we rode together to the turn-off, a road it was very easy to miss and which, in fact, was to lead us more or less to a rocky track. Then the rocky track dropped steeply downhill, so steeply that several of us decided to walk it. And, of course, in the end it brought us to the N834. We continued on this road for a while and then our route took us once more along a gravel path but this was actually quite suitable for cycling so there was not so much complaining. We enjoyed the ups and downs of the route’s nearly empty roads and eventually came to the same road we had used the day before, bringing us back to La Roche. 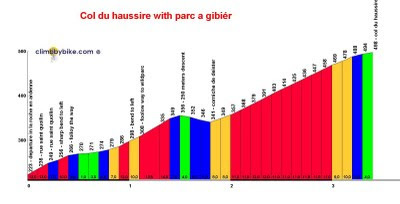 It was decision time: there was an optional loop which would take us up a tricky climb, the Col du Haussire. At breakfast I had considered skipping this but it was still early in the day and my legs felt good, so why not? Our brave band was down to four and after a false start, we soon found the small road leading up and up and up. The beginning of the climb seemed reasonable but I decided to take my time. It was only 3.3 kms long but about halfway along the forested road it began to pitch up. I could really feel gravity bite but I kept my pace steady, albeit pretty slow. No sign of cramping but plenty of effort involved. I saw the others ahead and I managed to come over the top with a big sprint finish. 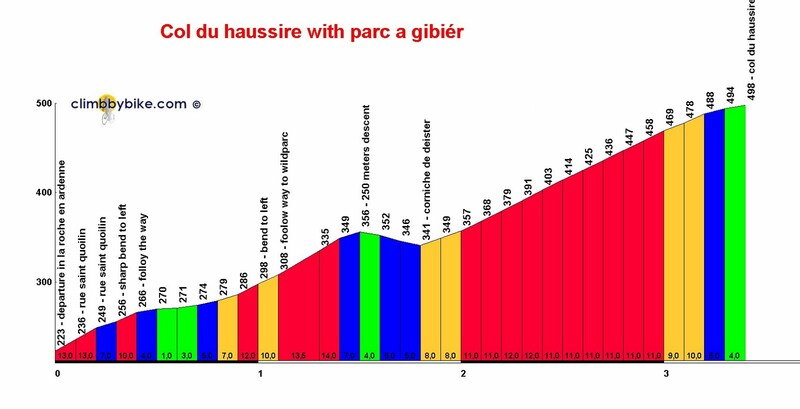 It turns out that the Col du Haussire is considered the toughest climb in Belgium as you gain 275 m of altitude. Although the average gradient is 8.3%, the steepest part is 18%! Feeling heroic, we bounced down the rather poor road on the north side and then turned left onto the main road, the N89, which rapidly brought us back to La Roche. It was here that I left the others and rode back to the hotel for a quick shower and packing up the bike and luggage to take me to Liège and the next installment of my Ardennes adventure: watching the pros race “La Doyenne,” the oldest bike race there is Liège-Bastogne-Liège.